Allie’s Helping Hands is a nonprofit that provides activities, homework help, and fun for siblings of children who are hospitalized with critical illnesses—children who spend much of their lives in the hospital visiting their sick brother or sister. 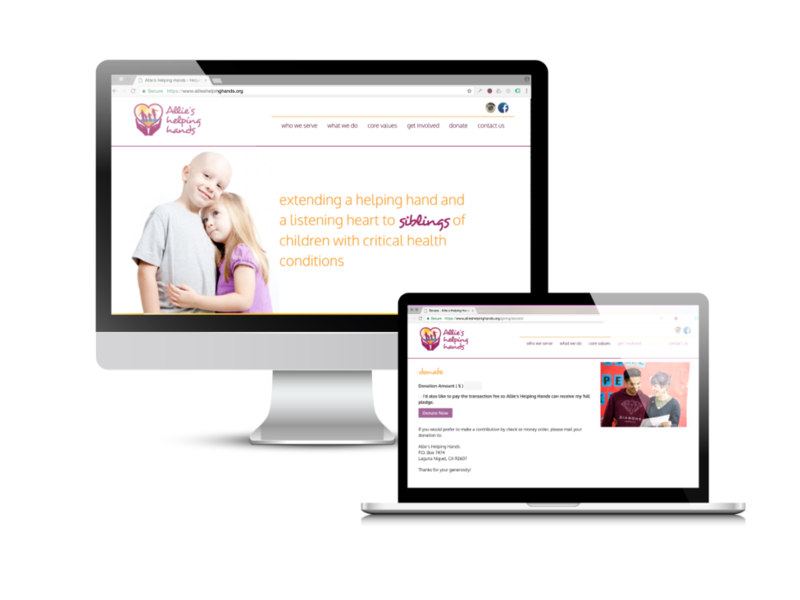 Kristen Lock Spalding, the founder of Allie’s Helping Hands, approached Crearé Web Solutions in 2014 to create a website to share the organization’s mission, tell its story, and spread the word about its programs. One important goal of the website was to raise additional funding for the nonprofit. Crearé Web Solutions worked closely with Kristen to create a professional, credible website that shares its story and vision with visitors. Allie’s Helping Hands also had us create a section of the website in anticipation of its first major fundraising event in August 2016, Step Up for Sibs. This page included a customized event registration form. Since the launch of the website the organization has been able to increase awareness in the Orange County, CA region. Their first fundraising event was a huge success, and they continue to receive donations on their website throughout the year to help support their amazing programs.